I release my exciting new kit The Anzacs: 100 Years On, In Story and Song, as part of the Commemoration of Anzac observances that will occur between 2014 and 2018. The kit consists of a prestigious hardcover, full colour book of 170 pages, with illustrated dust cover, containing around 100 superb photographs, maps, sheet music and a comprehensive text from me, presenting my thesis that we must deplore war, abhor and expose the armourers, but salute and respect the heroism of the man and women from Australia and New Zealand – the Anzacs – who volunteered for what they perceived to be a good cause. 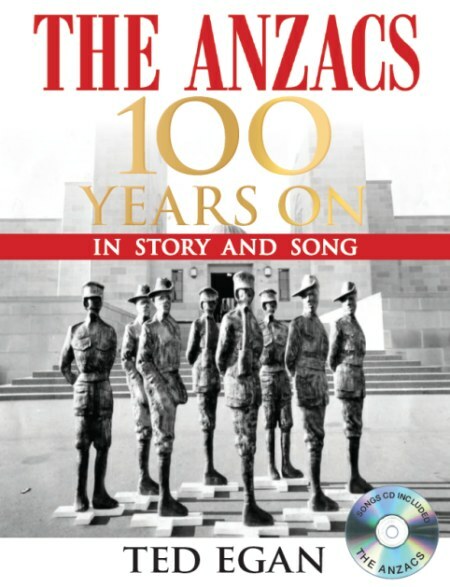 A FREE companion to the book is my CD album The Anzacs, comprising 20 relevant songs, most of them my compositions, recorded at best level by top musicians and singers. I come to this topic with a strong family connection and interest. My mother, Grace Brennan, had three brothers who volunteered to join the Australian Light Horse in 1914. Jack Brennan was killed at Gallipoli, Bob Brennan served three years straight in the horror of the Western Front. Martin Brennan went to the Middle East after Gallipoli, engaged in many conflicts, was briefly a prisoner of war, escaped, rejoined his regiment. I wrote my Song for Grace to record, word for word, the story my mother told me when I was twelve. She was the most anti-war person I have ever known. I invite you to order now. The price? Book plus CD $40. I will cover package, postage and autographing to your instruction.